D.E.E. Studio Productions Performing Arts Academy . . .
is the brainchild of Nancy Horak. AFFILIATIONS & ACHIEVEMENTS: Served as MUSIC DIRECTOR for the College of the Canyons Theatre Department, under the direction of theatre chair, Susan Hinshaw (2000 to 2004); and instructor – ‘Musical Theatre for Children’ (part-time status 2000 to 2004). Also, previously, a FACULTY member of the Ohio State University, Music Department (part-time status 1992 to 1994); and FACULTY of Field Muddle School, vocal/general music (full-time status 1972 to 1976). EXECUTIVE DIRECTOR of ‘D.E.E. (Developing Exceptional Entertainment) Studio Productions & Youth Talent Network’, a youth performance company that performed throughout Central Ohio for ten years, and presently in the southern California area for the past eight years. Performances have included appearances have included: Children's' Hospitals charities, ‘The Festival of Trees’, the ’Westfield Town Center’, ‘The Kids Expo’, ‘Molar Manor’, ‘Barnes & Noble Booksel-lers’, and ‘The Valencia Marketplace’ to list only a few of the local events and locations. Nancy received a special invitation from Disney to forward a promotional video for the Cruise Ship performances. D.E.E. Studio Productions worked hand-in-hand with ‘Public Affairs Director’ – Chuck White and remained the exclusive youth performance troupe for ‘WBNS’ (a CBS Affiliate). 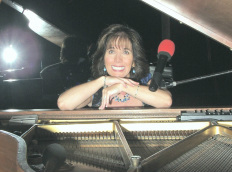 CONTACTED by 'Walt Disney World' to interview for a Talent Casting Director position, in 1998, and was employed by Disney as a pianist and vocalist, and an atmosphere entertainer at Epcot. CREATED a new concept – ‘Mickey at the Piano’ – presented for the ‘Creative Idea Forum’ (WDW), and was enthusiastically received and approved by the Walt Disney World’ executive team; additionally, CONSTRUCTED a pair of traditional ‘mouse’ gloves which allow for the flexibility to perform a completely diversified repertoire of piano music. APPEARED on numerous occasions, on syndicated television programs, including a presentation of "Nancy Dee -- A One Lady Show" for 'P.M. Magazine', that emphasized the school teacher turned entertainer. While on-the-road, Nancy performed her ‘One-Lady Show’ in many lounges and showrooms across the country. She performed on the 'Horizon', of Celebrity Cruise lines where she appeared as the featured pianist and entertainer in the ‘Plaza Lounge’. Among her more memorable piano performances, is a dinner music engagement for the Astronaut & Senator, John Glenn. Nancy has appeared as a side-line musician on Fox Network’s series of 'Boston Public', and Warner Bro-thers 'Pepper Dennis'. Other credits include appearances on Friends, E.R., Ali McBeal, Judging Amy, and previously, the role of ‘Mrs. Beauregarde’ in the Canyon Theatre Guild’s presentation of “Charlie and the Chocolate Factory”. 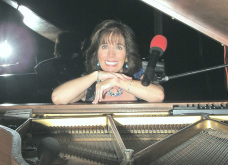 Nancy still performs as a pianist/vocalist for special events, and appears every Wednesday evening, at Barcelona Tapas Lounge, in the Valencia Marketplace on the Old Road in Stevenson Ranch. DESIGNED an Academy of Cultural Arts for the Canton, Ohio area. The academy offered instruction for all ages in musical theatre, acting, dance, the visual arts, and communications (audio & visual), as well as private instruction in both vocal and instrumental music. For the Santa Clarita Valley talent, in 2003, Nancy created and produced . . . 'SCV’s Most Talented Performers' – a talent competition for vocalists, as well as musicians, and is available for ages five through ‘Seniors’. She is presented the 2009 competition last Fall. It was a huge success--Congratualtions to all the finalists and the winner, Lydia Saxton. Hollywood voted #1 Acting Coach! Her career has spanned three decades in the entertainment Industry. She began coaching actors in 1992 and had been directing for 16 years. She is a graduate of the Strasberg Institute and was mentored by Sally Kirkland and Joseph Bernard. Diane has trained some of the hottest young talent in Hollywood including: Hailee Steinfeld, David Henrie, Jason Dolly, Danielle Panabacher, Kay Pananbacher, Shelbie Bruce and Joey Luthman. realism through unique attention to detail, depth and color harmony. and other professionals with performance-related issues. Annie -- no relation to Nancy! -- has been a musical theatre performer for 15 years. After moving from Texas to Santa Clarita in 2002, Annie began studying voice with Nancy and performing in productions with D.E.E. Studio. While studying at COC, she performed in numerous productions with the school and travelled with a Valencia-based theatre company teaching classes for children and teens in summer camps around the US. Annie is happy to now be back with the studio as Nancy's Director of Operations. In addition, it really is a thrill to have the opportunity to direct/teach the musical theatre workshops that she performed in under Nancy's direction years ago. industry -- starred in over 400 films and nominated for two Academy Awards! Ruben, you will be missed!